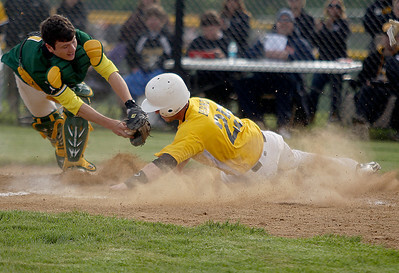 Sarah Nader - snader@shawmedia.com Crystal Lake South's Casey Oliver (left) is late to tag out Jacobs' Jon Berndt as he slides home during the third inning of Thursday's Class 4A Jacobs Regional in Algonquin on May 23, 2013. 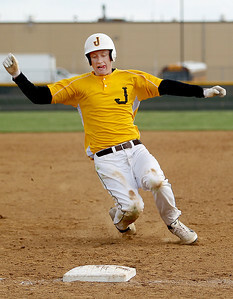 Jacobs won, 8-5. 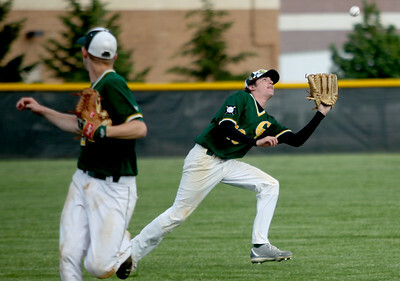 Sarah Nader - snader@shawmedia.com Jacobs' Grant Kale (left) waits for the ball while Crystal Lake South's Jake Bigos slides safely into second base during the first inning of Thursday's Class 4A Jacobs Regional in Algonquin on May 23, 2013. 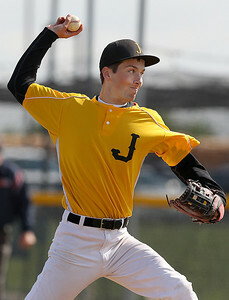 Jacobs won, 8-5. 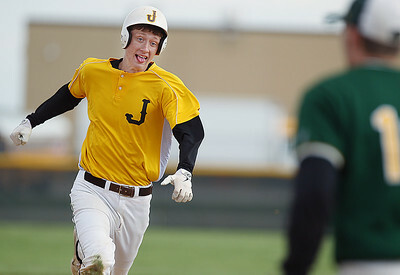 Sarah Nader - snader@shawmedia.com Jacobs' Nick Ledinsky runs towards third during the second inning of Thursday's Class 4A Jacobs Regional against Crystal Lake South in Algonquin on May 23, 2013. Jacobs won, 8-5. Sarah Nader - snader@shawmedia.com Crystal Lake South's Paul Wille catches a ball during the third inning of Thursday's Class 4A Jacobs Regional against Jacobs in Algonquin on May 23, 2013. 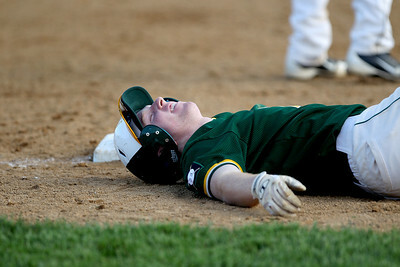 Jacobs won, 8-5. 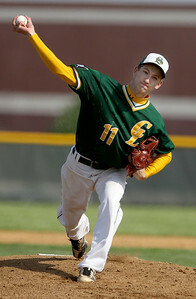 Sarah Nader - snader@shawmedia.com Jacobs' Evan Blunk pitches during Thursday's Class 4A Jacobs Regional against Crystal Lake South in Algonquin on May 23, 2013. Jacobs won, 8-5. Sarah Nader - snader@shawmedia.com Jacobs' Nick Ledinsky safely slides to third during the third inning of Thursday's Class 4A Jacobs Regional against Crystal Lake South in Algonquin on May 23, 2013. Jacobs won, 8-5. Sarah Nader - snader@shawmedia.com Crystal Lake South's Tyler Hall pitches during Thursday's Class 4A Jacobs Regional against Jacobs in Algonquin on May 23, 2013. Jacobs won, 8-5. Sarah Nader - snader@shawmedia.com Jacobs' Matt Hickey fields a ball during the fourth inning of Thursday's Class 4A Jacobs Regional against Crystal Lake South in Algonquin on May 23, 2013. Jacobs won, 8-5. 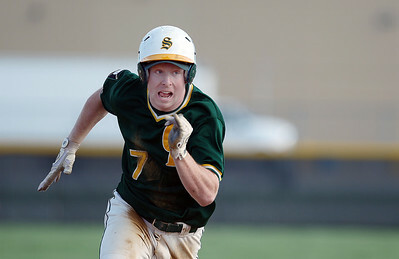 Sarah Nader - snader@shawmedia.com Crystal Lake South's Troy Bittenbender runs towards third base during the fifth inning of Thursday's Class 4A Jacobs Regional against Jacobs in Algonquin on May 23, 2013. Jacobs won, 8-5. Sarah Nader - snader@shawmedia.com Crystal Lake South's Troy Bittenbender is safe at third base during the fifth inning of Thursday's Class 4A Jacobs Regional against Jacobs in Algonquin on May 23, 2013. Jacobs won, 8-5. Sarah Nader - snader@shawmedia.com Jacobs' Ben Murray watches his foul ball while up to bat during the fifth inning of Thursday's Class 4A Jacobs Regional against Crystal Lake South in Algonquin on May 23, 2013. Jacobs won, 8-5. 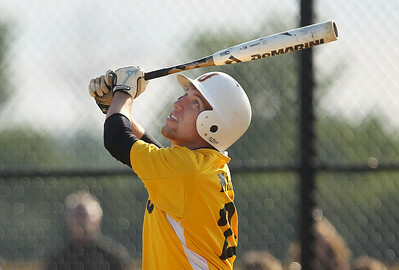 Jacobs' Ben Murray watches his foul ball while up to bat during the fifth inning of Thursday's Class 4A Jacobs Regional against Crystal Lake South in Algonquin on May 23, 2013. Jacobs won, 8-5.